Olivia Wilkins-Martin of Chesapeake, Virginia, is employed full-time as an Education Specialist with The Southeastern Tidewater Opportunity Project (STOP) Head Start Program and has been there for a total of 29 years. 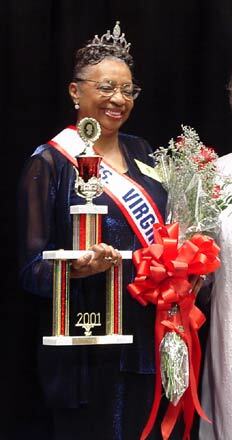 She is the founder and organizer of the STOP Organization Head Start Gospel Choir.Ms. Martin is a member of the Virginia State and National Read Start Associations, National Association of Senior Friends, Board of Director, Tidewater Community College/Early Child Childhood Department, and National Alumni Association, W. A. Pattillo High School (Tidewater Chapter Vice-President). A member in good standing of the First Baptist Church Westmunden, Chesapeake, Virginia, Ms. Martin sings in the Senior Sanctuary Choir and the New Gospel Choir. She is also a member of the Drama Club, Samaritan Club (Pastor's Aide) Women's Fellowship, Chairperson of the Senior Citizen's ministry and co-sponsor of the Youth Choir and the Praise Dancers.Other volunteer service includes assisting with the Tee-up for Kids Golf Tournament sponsored by the STOP Organization Head Start Program in conjunction with BB&T Bank. Ms. Martin has one daughter, Beverly Anita Wilkins-Cumbo of Chesapeake, Virginia and two grandsons, Jordan Darnell and Grant Mason Cumbo also of Chesapeake, Virginia.Ms. Martin enjoys singing, acting, working jigsaw puzzles and spending quality time with her family, especially her two grandsons. She also mentors several of her nieces and nephews along with several other youth of her church. 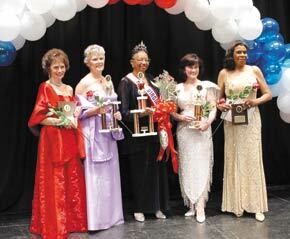 Olivia Martin, surrounded by the 2001 winners, Jane Lytle of Vienna, 1st runner-up; Patty Hinshaw, from Arlington, 2nd runner-up; Ebba Jo Spettel and Roberta Quander, both from Alexandria, were 3rd and 4th runners-up, respectively. (l-r) Ebba Jo Spettel, Jane Lytle, Olivia W. Martin, Patty Hinshaw, and Roberta Quander.